Functional fitness workouts are the key to long-term fitness, weight loss, and wellness. These carefully designed sessions won't leave you sweaty and breathless, but they can help you to burn more calories and stay active throughout the day. So how do you take advantage of functional training? First, it's important to understand why the training program works. What Is a Functional Fitness Workout? Functional workouts help to improve your balance, posture, muscular endurance and flexibility. During a typical session, you might do 5-10 different exercises that help improve the way that your muscles work together so that you feel more coordinated. During a functional fitness workout you might use body weight, dumbbells or other resistance equipment to strengthen your muscles. But this type of training is different than a traditional weightlifting program. During each functional training exercise, you have to focus very closely on the movement to stay balanced and maintain good posture. For many exercisers, functional training is a workout for the muscles and the mind. Functional training improves the way that your brain talks to your muscles so that your body works better. There are different ways to incorporate functional training into your regular workout routine. You can add a few posture and balance exercises into your weekly strength routine or you can work with a qualified trainer to build a more comprehensive program to improve the way your body looks and feels. Functional training helps your body to move more comfortable. And, of course, bodies that move comfortably are more likely to burn more calories without exercise. But can functional training can also make your other workouts more effective. And this benefit is key for people who are trying to lose weight. “Before you start any exercise program, it's important to identify areas of weakness or limitations in range of motion which could affect your performance, says Jason Corrie. Jason is a certified personal trainer who specializes in helping clients around the world get leaner, stronger bodies. He explains why every weight loss client should start their exercise program with a functional assessment. “Functional training can have a massive impact when you're trying to lose weight." He explains that when your body is working properly it becomes more efficient at burning calories. When your body burns more calories during exercise and burns more calories through activities of daily living, you lose weight faster. The best way to start a functional fitness workout program is to find a qualified professional. Personal trainers who practice functional training start by doing a complete evaluation of your movement patterns. They may identify past injuries and physical habits that have changed the way your body functions. Then they work together with you to retrain and rebuild basic movements so that the body moves more comfortably and efficiently throughout the day. You can also find a trainer by searching online. The American Council on Exercise provides a searchable database to help find a trainer in your area. And the American College of Sports Medicine has an online service to find qualified trainers as well. If you have a past injury or medical consideration, your doctor may also be able to refer you to a physical therapist to help you start a program. You can also join a gym that provides functional fitness equipment and classes. Planet Fitness, for example, provides PF360 and the Life Fitness S3 (TRX) equipment to help members take advantage of the newest functional training technology. 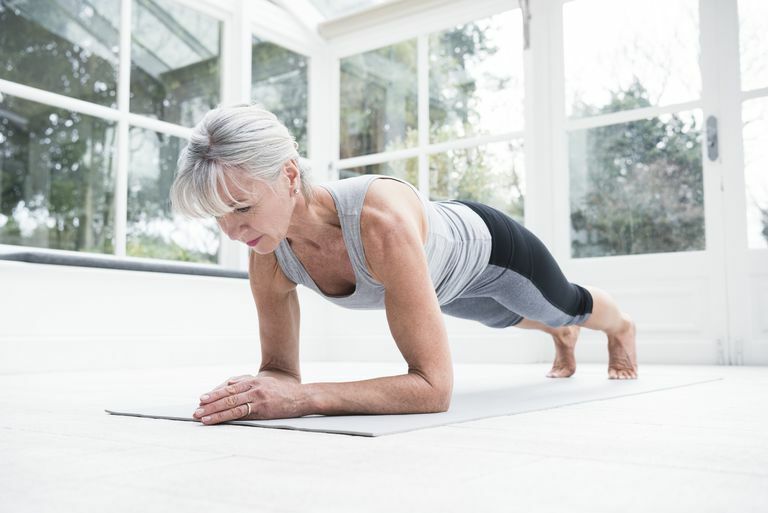 If you simply want to incorporate a few functional training exercises into your routine, you can start with a few simple routines that can help to improve balance and coordination. When you do any functional fitness routine, it is essential that you focus on doing the movements correctly, rather than doing them with more weight or doing more repetitions. Dead Bug: If you are a beginning exerciser, this exercise (performed in a supine position on your back) will help get your abdominal ready for more difficult movements. Shoulder Flexion: This simple shoulder exercise is perfect for exercisers who want to improve posture and increase flexibility in the upper back. Plank: This intermediate level exercise helps to improve core stability for improved posture and coordination. Single-leg stand: This basic exercise helps to improve balance and core strength. As you become more coordinated, add arm movements to challenge yourself. Single-leg squat: After you've become comfortable with the single-leg stand, you can add movement by lifting and lowering your body into a squat position. Lunge: If you're new to the lunge exercise, start in the lunge position and simply lift and lower your body, maintaining proper balance. As you get stronger, add movement. Step forward, back or to the side in and out of a lunge position or do a walking lunge to build strength, improve coordination and build muscle endurance. If you prefer to follow an online functional training program, consider using a program designed by Activmotion. All of the programs use the Activmotion Bar which is available for purchase on the company's website. But the bar—which is built with rolling steel weights inside—provides unique stability benefits that you don't get from other equipment. You can stream individual workouts from the Activmotion website or invest in the 60-day Ignite program so that you build your functional strength gradually. Functional fitness workouts need to be done on a regular basis to provide results. But you'll notice a real change in the way your body looks and feels if you do them consistently. Try to do your functional routine 2-3 times per week. As you become stronger and more coordinated, add new exercises that challenge the lower body and exercises that build strength and coordination through your trunk and core. American Council on Exercise. "What is Functional Strength Training?" Fit LifeMay 11, 2011. American Council on Exercise. ACE Advocates Functional Strength Training. Consumer Reports. "Functional fitness: workouts for the real world." September 2013. Do You Lose More Weight Running or Walking? Is Metabolic Testing Worth the Cost?